The bustling markets, soaring temples and ancient wonders of Asia are no longer the exclusive domain of adventure travellers and backpackers. Once accessible mostly to the intrepid and determined, much of Asia’s extraordinary colour and culture is now within easy reach for a new class of traveller – one who wants more than just the beaches and nightclubs. Global tour company Cosmos has seen a rapid growth in its Asian holidays in recent years, offering the same style of travel it perfected in Europe and North America over the past half century. Destinations across China, Vietnam, Cambodia, Thailand, India and Japan can all be explored in an escorted group with ease, and the value-conscious traveller can see Asia without the high cost of upmarket operators or the rough-and-tumble of adventure tour companies. Cosmos has released more than a dozen different Asian escapes for 2014, each designed to make travelling as easy and rewarding as possible. Its itineraries are priced from $105 per day and combine the iconic landmarks with those unexpected gems that make travelling so memorable. There’s free time to relax or explore on your own, and longer stays in key destinations so that travellers gain an even better insight into the local culture. Among the most popular destinations is China, where Cosmos offers a choice of five different itineraries, many including a cruise on the mighty Yangtze. No visit is complete without the imposing scale of the Forbidden City, the endless turns of the Great Wall, and the haunting ranks of the entombed warriors at Xi’an. But Cosmos also delves deeper, offering a chance to see the landscapes that inspired China’s great painters and poets, like the striking peaks of Yellow Mountain and the towering walls of the Three Gorges. In Vietnam, Cosmos combines the old French boulevards of Hanoi with the busy streets of Ho Chi Minh City, putting travellers among the flaming woks and thriving streetstalls. But Cosmos also uncovers the country’s picturesque rural life – among the coconut groves and rice paddies, or sailing among the fishing boats and limestone outcrops of Ha Long Bay. In India, Cosmos tours have been designed to navigate through a bombardment of vivid colours, intense flavours and exotic scents. In each itinerary, India’s exciting pace has been tempered with the beauty and serenity of its sacred monuments and remarkable landscapes. Near Jaislamer, travellers can take a camel ride as the sun sets over the dunes, or in Udaipur, gaze across mirrored waters at the Lake Palace while boating on Lake Pichola. 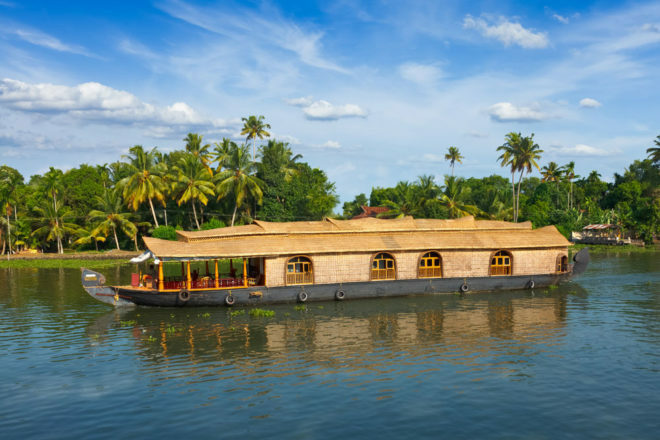 Or in the tropical south, they can relax on an overnight excursion on a traditional houseboat, plying the palm-fringed backwaters of Kerala. Other itineraries explore Japan, Sri Lanka, and Thailand, plus there’s a choice of add-ons to destinations including Cambodia, Hong Kong, Phuket and Koh Samui. Each tour includes accommodation, transport, activities and attractions, many meals and the help of knowledgeable guides. Each hotel has been chosen for its comfort and value, which combined with the cost-advantage of travelling in Asia has allowed a much higher standard of international hotel than in other regions.